I've been going through my archives lately and looking at old photos. It's fun and enlightening, because in some photos, I see how far I've come with my photography. Other photos, I simply forgot I even had. That's what happens when you take so many photos, I guess. I took the following photo on October 3, 2008. I had only had my DSLR camera for three months! I was asked to come photograph a family for a small family reunion, and while photographing them at a local bed and breakfast, one of the family members noticed and commented on this red sunflower. 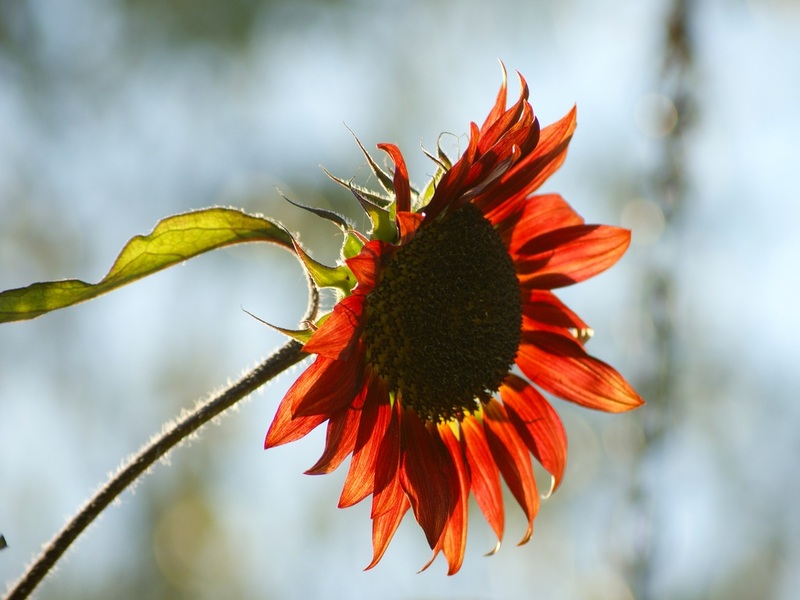 After the family photos were done, I, of course, had to photograph the sun highlighting the red sunflower. I suggest you click on the photo to view it larger. Terrific capture! Love the colour. the light is beautiful. wonderful shot. That's one very magical photo Misty. Just beautiful! I didn't even know red sunflowers existed until last year. Hubby bought a packet of sunflowers and a few red seeds must have been mixed in. They are beautiful, as is your photo. I love sunflowers in general but especially the red ones! All my flowers are gone. :o( Stupid winter and snow! I`m glad I came across this post, no matter how old it is. I didn't knew that there are red sunflowers. Beautiful photo and it`s kinda special to me, because of this photo I now know about red sunflowers. I think that is quite something. Thank you.